Point Pleasant junior Luke Wilson (1034) stays ahead of the pack during the Class AA 1600m run held Saturday at Laidley Field in Charleston, W.Va.
Point Pleasant sophomore Sami Saunders takes flight during the Class AA long jump event on Friday at Laidley Field in Charleston, W.Va.
CHARLESTON, W.Va. — So much for an unlucky number. 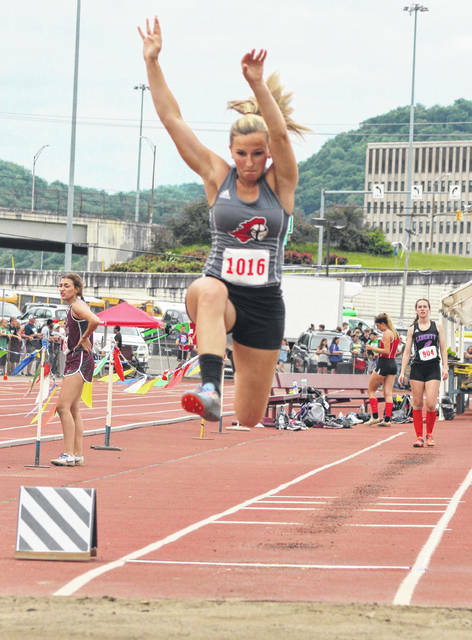 Both Point Pleasant programs came away with 13 points apiece this past weekend during the 2018 WVSSAC Class AA track and field championships held at Laidley Field on the campus of the University of Charleston. The Lady Knights earned three podium finishes and tied with Elkins for 13th place out of 27 scoring teams, while the Black Knights had six podium placers and ended up 14th out of 23 scoring teams. The Point Pleasant girls — who scored at least one point at the state meet for a 15th consecutive postseason — got all of their points from one athlete as sophomore Sami Saunders earned a trio of top-six efforts. Saunders — who finished on the podium in both the high jump and pole vault at the 2017 Class AA meet — tied for third in the pole vault with a cleared height of 9 feet, 6 inches. Saunders was also fourth in the long jump (16-3) and fourth in the high jump (5-2). Junior Teagan Hay was 10th in both the 100m (13.46) and 200m (27.56) dashes, while sophomore Hannah Gleason was 11th overall in the shot put with a throw of 85 feet, 8 inches. Junior Madison Hatfield was 12th in the 400m dash with a time of 1:03.59, while junior Allison Henderson also placed 14th in the 800m run with a mark of 2:32.56. Saunders, Hatfield, Hay and junior Sydnee Moore were ninth in the 4x100m relay (53.06), with Moore, Henderson, Hatfield and Hay also placing 10th in the 4x200m relay with a time of 1:52.09. Henderson, Moore, Hatfield and sophomore Ashley Staats also finished 11th in the 4x400m relay with a mark of 4:29.66. The Bridgeport girls won the Class AA championship with 152.5 points, with Winfield (100.33) and Oak Glen (35) rounding out the top three spots. Isabella Bowen of Bridgeport was the AA high-point scorer with 32.5 points. The Black Knights — after coming up empty last spring — scored at least one point at the state meet for the 15th time in 16 years, although the Red and Black did not have a top-three finish at this year’s competition. Junior Luke Wilson came away with a pair of fourth-place efforts in both the 1600m run (4:33.55) and 3200m run (9:58.24), while sophomore Steven Trent ended up fifth in the pole vault with a cleared height of 12-feet even. Junior Eddie Mayes finished sixth in the shot put (45-9¼), while senior Jesse Gleason was sixth in the discus (135-1) and 13th in the shot put (40-8¼). The 4x100m quartet of Trent, juniors Cason Payne and Josh Wamsley, and sophomore Jovone Johnson also placed sixth with a time of 45.14 seconds. Sophomore Trevon Franklin was seventh in the shot put with a throw of 45 feet, 8¾ inches. Senior Alex Gibbs also placed 10th in the discus final with a heave of 129 feet, 2 inches. Sophomore Brady Adkins finished 11th in the 300m hurdles (44.01), while Payne was 12th in the 200m dash with a time of 23.85 seconds. Sophomore Kaydean Eta also placed 13th in the 110m hurdles with a mark of 16.87 seconds. Sophomore Logan Southall competed in the high jump final, but did not place after missing three times on the opening height. Southall, Adkins, Eta and sophomore Zach Rediger claimed seventh place with a time of 1:02.72 in the 4x110m shuttle hurdles relay, while Johnson, Payne, Wamsley and sophomore Garrett Hatten finished eighth in the 4x200m relay with a mark of 1:34.73. The quartet of Payne, Wamsley, Hatten and sophomore Nick Leport ended up 14th in the 4x400m relay (3:43.11), while the foursome of Wilson, Leport, Adkins and sophomore Peyton Hughes were 15th in the 4x800m relay with a mark of 9:21.79. The Bridgeport boys won the Class AA championship with 105 points, with Winfield (89) and Weir (63) rounding out the top three spots. Aaron Withrow of Winfield was the AA high-point scorer with 32.5 points. Of Point Pleasant’s 23 competitors at the state meet, only two are seniors. All but one of the eight podium placers are also underclassmen. 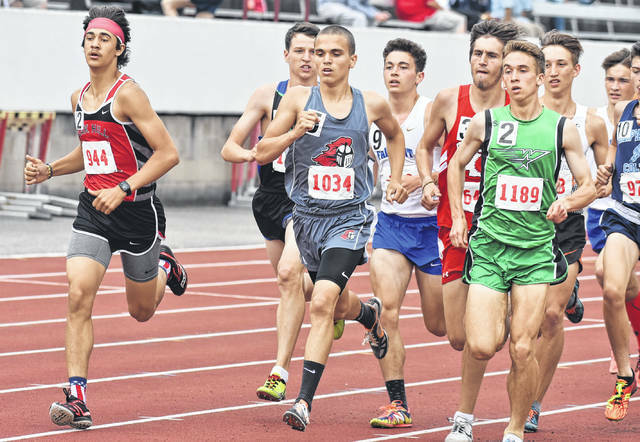 Visit runwv.com for complete results of the 2018 WVSSAC Class AA track and field championships held Friday and Saturday at Laidley Field.